She's the Devil Incarnate. She's Christine. Body by Plymouth. Soul by Satan. After a student purchases a 1958 Plymouth Fury, he discovers that the car possesses a number of unique features. Deep within it, the boy discovers, there lives an unholy presence. 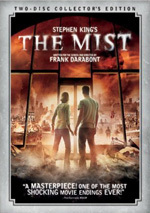 Director John Carpenter's film is based on Stephen King's bestseller. $3.408 million on 1045 screens. Noted horror director John Carpenter meets up with famed author Stephen King in this 1983 adaptation of Christine. The flick opens in 1957, as we see a red Plymouth Fury fresh off the assembly line. First a worker’s hand gets caught when the hood falls on it, then another employee perishes in the front seat after he carelessly drops his cigar ash. Coincidence? No – foreshadowing. With that we jump to 1978 to meet nerdy high school student Arnie Cunningham (Keith Gordon). Even though he hangs out with his cooler jock buddy Dennis (John Stockwell), Arnie gets no attention from the ladies and no respect from the other guys. He also suffers under the controlling arm of his domineering mother (Christine Belford). Arnie sees that ’57 Fury rotting in an old dude’s front yard and falls in love with it immediately. He learns the car’s called “Christine” and immediately buys her even though she’s in terrible shape. Arnie’s love may be irrational, but he goes for it anyway, and he devotes himself to Christine’s restoration. All of this impacts Arnie’s personality, as he becomes cockier and more aloof; Dennis hardly sees him anymore. The change does benefit Arnie in the dating department, as he starts to date cute new girl Leigh (Alexandra Paul), but otherwise, Arnie becomes something of a prick, as the effect of Christine brings out the worst in him. We soon see more nefarious side effects from the car, as it demonstrates a decidedly evil side. Most King novels work better on the printed page than they do on the big screen. I’m not quite sure why this is, since it’s not like King writes in a way ill suited for the movies. However, not too many of King’s horror stories have fared well when they made the leap to the cinema, and Christine becomes another disappointment. Many of the problems relate to the manner in which Carpenter tells the tale. For one, Christine suffers from point of view problems. At the start, it shows us events from Dennis’ perspective, but he soon becomes an afterthought. We then leap to Arnie’s POV but much of the second half doesn’t really come from any particular viewpoint. It just blithely depicts events without any real angle. This makes the movie seem unfocussed and scattered. In addition, Christine displays awkward character development. Arnie literally makes the leap from nerd to psycho jerk overnight. We don’t see a natural progression as he changes. Perhaps one could argue that Christine has such a strong effect on Arnie that he does become a different guy in no time at all, but it doesn’t feel right. Honestly, the movie leaves the impression that it’s missing scenes. Arnie starts to work on Christine and all of a sudden the car’s done, he’s dating Leigh and he’s an arrogant jerk. Couldn’t we see some of Arnie’s evolution? Maybe no one thought Gordon could pull off a smooth transition. During the first act, the actor plays Arnie like a cartoon nerd, and then he quickly turns the character into a one-dimensional jerk/psycho nutbag. There’s no subtlety to either side of the performance, and the flick falters. I think Christine might’ve worked better if it painted a psychological picture. Since it imbues Christine with magic powers, it plays as a fantasy, a tone that just becomes too goofy much of the time. If the flick stayed with Arnie’s POV and didn’t make Christine’s amazing abilities clear, it might’ve been more compelling. It’s also weird how readily everyone seems to accept Christine’s supernatural powers. When the cops investigate, they seem to suspect the car more than they do Arnie! His pals also fear the car’s abilities without much thought toward the absurdity of that concept. Movies usually take the other approach and show characters who don’t accept unnatural properties despite vast amounts of proof to the contrary, but Christine heads too far in the opposite direction. Everyone buys into the “magic car” theory way too easily. Some good scenes emerge in Christine, but the whole becomes much less than the sum of its parts. 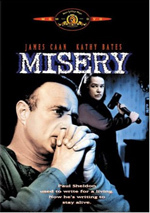 Perhaps a lot of my complaints relate to the original novel; I don’t think I ever read it, so I don’t know how closely the film adheres to the source. Whatever the case, I just don’t feel the flick succeeds. 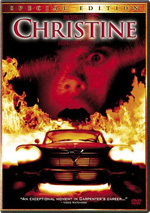 Christine appears in an aspect ratio of approximately 2.35:1 on this single-sided, double-layered DVD; the image has been enhanced for 16X9 televisions. Though never great, the transfer seemed at least adequate. A few concerns with sharpness arose. Though most of the flick appeared acceptably concise and well-defined, wide shots could come across as a bit soft. Those remained infrequent, though, and the film usually looked good. I noticed no issues with jagged edges or moiré effects, but a little edge enhancement cropped up through the movie. Print defects demonstrated minor distractions. I saw sporadic examples of specks, marks, and nicks. Not a lot of these appeared, but they created occasional nuisances. Blacks showed good depth and darkness, while shadows offered nice clarity and delineation. Colors were decent and that was about it. A few shots showed pretty good vivacity, but the tones usually seemed somewhat muddy, with an emphasis on slightly runny reds. Skin tones tended to be too ruddy as well. The hues weren’t bad, but I thought they weren’t as natural as I’d like. None of this created significant problems for Christine, so I thought it ended up as a “C+” transfer. Along the same lines, I felt the Dolby Surround 2.0 provided an average affair for a flick from 1983. The soundfield opened things up to a slight degree. Music showed decent stereo imaging and spread to the surrounds in a mild way. Speech tended to bleed to the sides a little, and that caused some distractions. Effects used the front side speakers in a decent manner, though not much more than that. They added some movement and life, especially to scenes with cars, but they failed to bring out much dimensionality. Surround usage stayed minor, as the back speakers contributed largely inconsequential reinforcement. Audio quality was dated but decent. Lines sounded reasonably natural; the lines lacked edginess or other flaws and always remained intelligible. Music sounded pretty good, as the score demonstrated acceptable range and clarity. Effects were less impressive, as they tended to be moderately thin and without much gusto. They weren’t bad, but they just didn’t show much pizzazz. All in all, this felt like a “C+” to me. In terms of extras, we start with an audio commentary from director John Carpenter and actor Keith Gordon. Both sit together for this running, screen-specific piece. They discuss locations and sets, the adaptation of the novel, effects and stunts, cars, cast and characters, performances and relationships on the set, and stories from the shoot. Carpenter and Gordon fit together well during this consistently enjoyable commentary. Not only do they provide a good look at the flick’s creation, but also they offer interesting tidbits such as filmmaking superstitions. Gordon’s subsequent work as a director allows him to give us a good dual perspective, and both men are frank and funny. I really like this track. 20 Deleted Scenes fill a total of 26 minutes. With so many sequences on display, you’d expect at least a few of them to be interesting, right? Nope – overall, they’re pretty dull. Many offer simple extensions of existing scenes, and we also get tedious material like additional takes of the bullies as they attack Christine. The most useful show the growth of the relationship between Leigh and Dennis; I think these are unnecessary, but at least they’re mildly worthwhile. Most of the segments don’t contribute anything. Three featurettes follow. Christine: Fast and Furious goes for 28 minutes, 52 seconds and mixes movie clips, archival elements and interviews. We hear from Carpenter, Gordon, screenwriter Bill Phillips, producer Richard Kobritz, stunt coordinator Terry Leonard, and actors John Stockwell and Alexandra Paul. 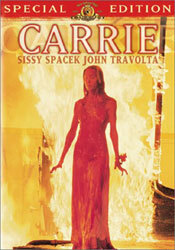 “Fast” covers actors, characters and performances, locations and the cars, effects, changes from the novel, the film’s depiction of violence, stunts, and some shoot specifics. Since the commentary covered so much, repetition becomes inevitable, but repeated elements remain minimal. Most of the material is fresh, and the added perspectives help. I think the featurette doesn’t flow terribly well – it jumps from one subject to another without much logic – but it informs and remains enjoyable. Christine: Finish Line lasts seven minutes, 15 seconds and features Phillips, Carpenter, Kobritz, Paul, Stockwell, and Gordon. “Line” looks at the movie’s music as well as the film’s reception and how it’s held up over the years. I like the notes about the score and source music, but the other parts tend to be a bit dull. A few good tales emerge, such as when Carpenter describes his dismay when he realized how egotistical posters plastered with his name looked, but the featurette doesn’t include a ton of solid information. Finally, Christine: Ignition goes for 11 minutes, 51 seconds and includes notes from Kobritz, Carpenter, Phillips, Gordon, Stockwell, and Paul. We learn about the novel’s path to the screen, how Carpenter came onto the project, the book’s adaptation and changes, finding and renovating the cars used in the flick, casting and performances. “Ignition” gives us a lot of good info and proves satisfying, but I can’t figure out why the DVD presents it last. It really should’ve been the first featurette in the sequence, not the final one, since it deals with pre-production elements. Well, if you read this before you watch the disc, just view this one and then “Fast” and “Finish”. Despite its odd placement, “Ignition” offers many interesting notes. Some basics fill out the disc. We find Filmographies for Carpenter, Gordon, Phillips, Stockwell, Paul, author Stephen King, and actor Harry Dean Stanton. We also get Previews for Hellboy, Asylum of the Damned, Secret Window and Stephen King Presents Kingdom Hospital. No trailer for Christine appears here. Christine features a good premise and a few effective sequences, but it sags too much of the time to succeed. From awkward storytelling to an over the top lead performance to weird suspensions of disbelief, the movie never really gets into first gear. The DVD presents acceptable picture and audio as well as a nice roster of supplements. I’m not wild about the movie, but fans should be happy with this release.